Welcome to Part 1 of the new series on Symptoms of ADHD! 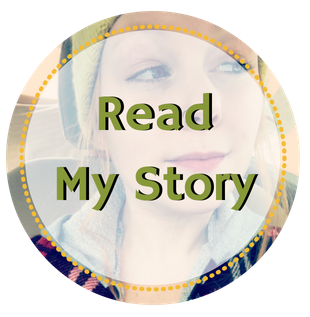 For each of the three parts I’ll be listing and explaining 5 symptoms of ADHD you probably didn’t know about, and I’ll talk a little about my own experiences with them. Remember, ADHD is a spectrum and you may not have all of these symptoms or you may experience them in varying degrees compared to another ADHDer. ADHD and OCD can overlap in many ways. Some people may actually have both disorders, while others just have ADHD symptoms that look a lot like OCD. I spent most of my life thinking that I had mild undiagnosed Obsessive Compulsive Disorder. I would joke about “having OCD”, even being scolded at times for making light of a serious mental disorder, but I wasn’t totally kidding. I really felt like I had it. My experiences with OCD tendencies have been happening since childhood. I would regularly hoard things, even bits of trash I deemed somehow special. I’ve always had an obsession with the number 4, and as a kid (even sometimes now as an adult) I would feel compelled to do things in fours and I would feel a little on edge until I did it. Floors with multicolored tiles were the worst. I always felt like I had to step on one color tile with my one foot (being sure to step down with a specific part of my foot even) and then I’d have to step on the next color tile with the exact same part of my other foot. I would do this four times and then start over as I slowly made it across the floor. If I stepped down with the wrong part of my foot I’d have to add a whole new sequence of four using the new part of my foot while finishing the first sequence. That was probably a headache to even read… imagine actually having to do it. And do you know where most multi-colored tile floors are? In schools of course. Yep, I was that weird kid that slowly made it through the school hallways, looking down at their feet in full concentration. 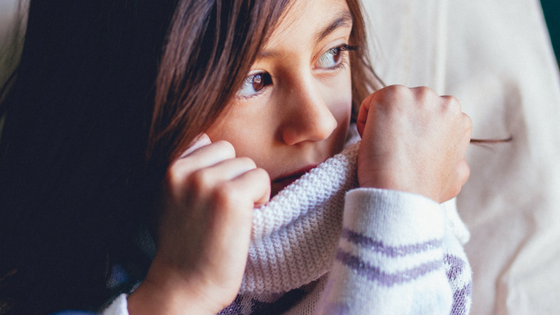 There are many ways the OCD-like tendencies of ADHD can manifest. Especially in situations where I feel anxious or uncomfortable, I’ll begin fidgeting to cope with the discomfort. Fidgeting also helps ADHD brains concentrate, so that’s also a big reason for it. I’ve always had an obsession with symmetry and order in nearly all areas of life, which has become more prevalent with age. When I was younger it was very frustrating for me because I didn’t have the energy or know-how to create order in my life. So I would feel this overwhelming desire for a nice clean room, but wouldn’t ever do anything about it. As my perfectionism has intensified over the years, I’ve started to use it to my advantage to counteract my natural inclination towards laziness and subsequently have struggled less and less with depression and anxiety. All my life I had a consistent stream of worried thoughts flowing through my mind. At every moment I was on high alert, hyper vigilant, and aware of every negative outcome that was possible in any given situation. As you can imagine, it’s not a picnic being around someone who is always on edge like that. I’m surprised I had any friends at all. This is something my ADHD medicine has surprisingly helped me with tremendously. I just started on it a few months ago, and I honestly expected the meds to make the stream of worries a little worse. I was sort of dreading it. 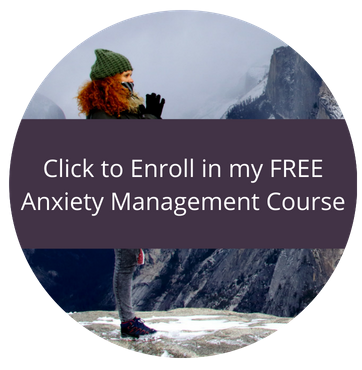 But to my relief, the FIRST day on the medication I found that my mind was quiet, and the worries were still there but I could actually decide whether or not they were valid and choose if I wanted to ignore them. This has been a huge game changer for me. The difference is like night and day. This is a weird one, and it’s something I always assumed was unique to me. But apparently many people with ADHD have had the same thing. This has been happening since childhood as well. Basically, I have these strings of words that don’t make a coherent sentence but for whatever reason they tend to repeat in my mind over and over at random times. I also have strange rhymes that I repeat in my head at times. Like sometimes when I think something is funny, in my head I’ll start mindlessly repeating the words “funny bunny”. This happened a lot worse when I was a kid, especially on certain medications doctors would put me on. The medication I’m on now doesn’t seem to intensify it as badly as other meds did back then thankfully. Some of my repetitive body tics were winking my right eye (still deal with this one sometimes), scrunching my nose, and forcefully blinking both eyes. This goes along with the excessive & repetitive worry. When I first started driving I would repeatedly check that the car doors were locked by pushing the lock button as I drove, over and over and over until they actually broke because I did it so often. To this day I still have a couple obsessive checking habits while driving such as checking and rechecking that the parking brake is down throughout the drive.I also repeatedly “check” on things I’m worrying about by asking my boyfriend the same questions way too many times, such as “Is the stove off?” “Did we feed the animals?” etc. often forgetting that I already asked. (BFRBs for short) These are also considered a symptom of OCD but have recently been looked at as a symptom of ADHD for some people as well. 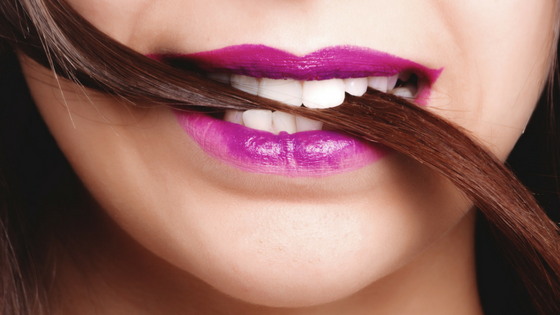 A major feature of BFRBs is poor impulse control, which people with ADHD are known for. So while the average person could look at a pimple in the mirror and decide to leave it alone to prevent scarring, someone with ADHD who has a tendency towards BFRBs will look at that pimple and immediately give into the urge to squeeze it. When I was in highschool I had horrible acne. It felt literally impossible to leave my face alone. I was constantly picking at it and making it worse and worse. Now I have scarring because of that. Problems with sleep associated with ADHD usually appear around the age of 12 on average, but have been observed in younger ages too. ADHD doesn’t just go away because it’s time for bed. It’s always there. ADHDers are often “night owls” and have trouble shutting their brain off when it’s time to go to sleep. Many of us even get a burst of energy at night, sort of like a second wind. Our creativity and motivation suddenly kicks in right when we should be winding down. Either that or our mind races, jumping from one anxious thought to another. Sometimes it can take more than an hour, even several hours to finally fall asleep. The older I’ve gotten the more I’ve struggled with insomnia. I find that reading fiction before bed helps calm my brain and makes my eyes get heavy. Also taking magnesium has been a huge help. I’d check with your doctor though to make sure you can take it before trying that. A lot of ADHDers report very restless sleep. Awakening at any noise, tossing and turning, adjusting and readjusting. It’s not uncommon for people with an ADHD partner to choose to sleep in another room because of this. For restless ADHD sleepers, sleep often isn’t refreshing and they end up waking up as tired as they were when they went to bed. People with ADHD can awaken multiple times throughout the night until they fall into a deep sleep which they have extreme difficulty waking up from. They will sleep through multiple alarms, and through attempts of partners or family members to get them up. A lot of times they will be irritable, even aggressive, if they’re woken up before they’re ready. Many of them say they aren’t even fully alert until noon. I struggled with this the most when I was in high school. I would set 5-10 alarms for myself to get up for school, and would sleep through nearly every single one. My parents would try desperately to wake me up, but usually nothing they said or did could make me budge. Have you always been told you were “too sensitive”, “excitable” or told you take things too personally? Emotional Dysregulation isn’t commonly talked about in relation to ADHD even though it’s a huge part of how ADHD affects our lives. Most people with ADHD have this symptom, but often assume it to be caused by something else. Maybe they assume they’re just a sensitive person, or maybe they even assume it’s because of some other mental disorder like bipolar. The thing about ADHD and Emotional Dysregulation is that we still experience the normal emotions that everyone else experiences. It’s just that we feel them far more intensely and even for longer than the neurotypical person feels them. Our brains have trouble regulating the emotions. So we have a lot more trouble calming down and making good choices when an emotion hits. This doesn’t just apply to negative emotions. It applies to positive ones too. When we’re happy, we are very happy. But when we’re afraid, we can be very afraid. We can be very sad or very mad. This video from How to ADHD explains Emotional Dysregulation really well. I love this girl and all her videos. In fact, her channel was what got me to take another look at ADHD and how it could be affecting my life. I swear, this is the bane of my existence. I have so many memories from childhood of crying at the drop of a hat and humiliating myself. I remember at the start of every school year I would tell myself “Okay, I am NOT going to cry this year” but sooner or later something would happen and I would find myself sobbing like a baby in front of all my classmates over something most kids wouldn’t have bat an eye at. This trend continued into my teenage years, breaking down into tears at school and eventually at my first ever job. I worked at a movie theater scooping popcorn and tearing tickets. I had mostly only been around my church friends until that point, and wasn’t that socially involved in my public high school so I had very little real world experience. Dealing with the customers at that movie theater was like a shock to my highly sensitive system. I didn’t know how to respond to someone being mean or even slightly rude to me, and my lack of experience with the real world combined with my already heightened sensitivity from the ADHD turned out to be a real mess. My supervisors ended up regularly staying nearby when I worked so they could step in if I started crying, because I would just bail. I’d run right into the back room, thoroughly humiliated and not knowing what else to do. Even now in adulthood I have so much trouble regulating my emotions. Luckily I’ve grown a bit of a tougher skin, but not that much tougher. If you catch me on a day where I’m already feeling a little off, I will for sure have a meltdown if you’re rude to me. I haven’t had a public crying episode in quite a few years now, until the other day actually. I was at my psychiatrist’s office and I was having a bad day before I arrived. One of those days where nothing seems to work properly, stuff keeps breaking, and just little things are going wrong left and right. A real off-day. And of course, a mix-up happens while I’m there which is much too complicated for me to get into here, but suffice to say there was a lack of proper communication on my doctor’s part, and I was trying my best with the information I had to get the situation worked out and solved. Eventually I became so confused and flustered with the issue that my brain suddenly decided to give up and turn off. So I stood there literally stunned with intense emotion, and I felt the sides of my mouth begin to involuntarily turn downwards. I knew that meant I was about to start sobbing in front of my doctor and everyone else in the waiting room. I also knew that there was nothing I could do to stop it. My brain was turned off. All that was left was this overwhelming feeling of humiliation and frustration, and all I could think about was how I wanted to either melt into the floor or bolt out of the room. With tears streaming down my face I mustered a weak apology and said I would call to figure it out later. I walked through the waiting room, trying to ignore the expressions of confusion and pity on the faces of everyone sitting there, and I left. I sat in my car weeping and feeling totally defeated. I thought I had grown out of public crying incidents! I cried the whole way home and then continued to cry when I got there, as I told my boyfriend about my day. I don’t even know how I had that much fluid in me. 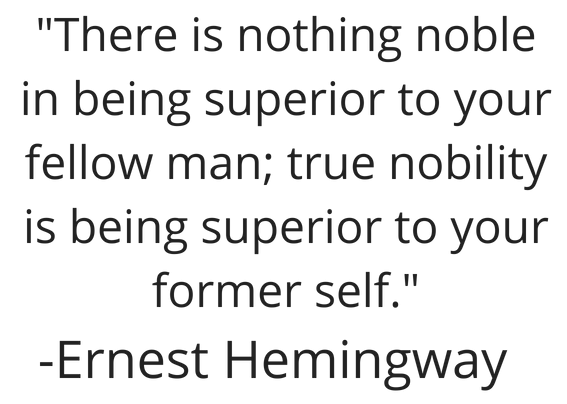 If you’re familiar with me or what my blog is about, you probably know that I’m a big fan of self-awareness. I call this a Conscious Mental Health blog because I believe in the importance of self-reflection and bringing light to every area of your consciousness so you can tweak whatever you’re able to tweak and optimize your mind to the best of your ability. 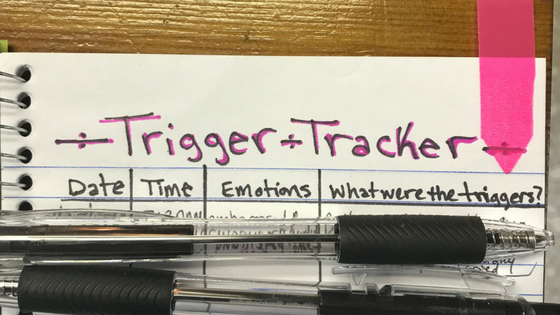 When it comes to regulating your emotions, something that can be an enormous help is a Mental Health Tracker. The video I linked to above mentions tracking your emotions, but she does it a little differently than me. 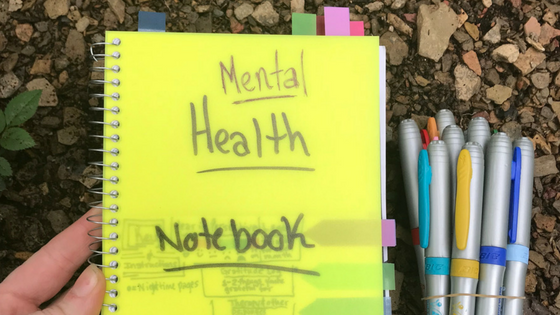 I made my own Mental Health Bullet Journal, which I modeled after parts of Nico Mochi’s mental health bullet journal spreads. Her spreads are much prettier than mine, but one of the annoying things about ADHD is that no matter how pretty I try to make something it usually turns out a little messy. But oh well. This is my Mental Health Journal. Sloppy, but efficient. I keep my different colored pens together in a rubber band and sit them right next to the journal for easy access. This is The Key and Instructions for the different sections of the journal. I have each section marked with the same colored tab I used to mark the page it’s on so I can easily find each one. I marked two of the sections as “nighttime pages” because I fill them out every night before bed. Each night I fill out the Year in Perspective and the Gratitude Log. For the Year in Perspective I have a certain color representing each emotion, and at the end of the day I’ll record what emotion I felt that day. As you can see in the pictures, I often have to use multiple colors for one day. Who knew mood swings could be so colorful and pretty? At the end of each month, I tally up how many days I felt each emotion and record the totals in the “Legend” section. 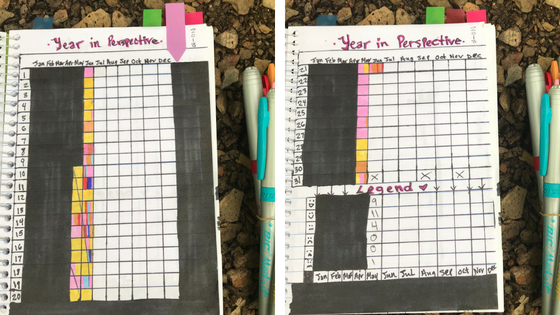 The point of the Year in Perspective is to do just that… put the year in perspective. After only doing this for a couple months I’m already surprised how often I have good days. I sometimes think that I have more bad days than good ones, so it’s nice to see proof that that’s not true. Now when I have a bad day I like to go back and look at all the happy days I’ve had to remind myself that bad isn’t my norm. 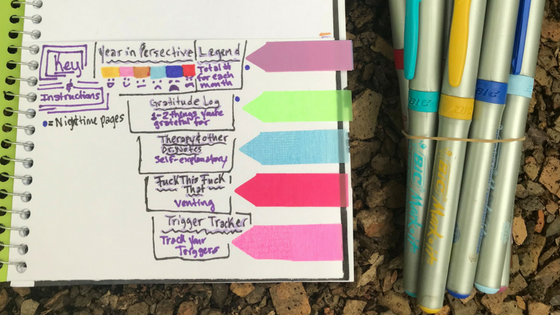 Another great thing to look back on when you’re having a bad day is a Gratitude Log! I didn’t include a photo of mine, but basically you just write down what month you’re in at the top of the page, then write 1-31 (or however many days are in that month) down the side. Each night you think of at least one thing you’re grateful for and write it down for that day. It doesn’t matter how stupid or insignificant it may seem. Just write anything you can think of to be grateful for. I’ve already noticed a difference from doing this. It helps to shift me into a positive state of mind at night before going to sleep and it’s never a bad thing to think about the good in your day. Excuse the french, but when you need to vent…cursing is 100% acceptable if you ask me. Especially in the privacy of your own mental health journal. These pages are meant for venting and letting all the icky emotions out. Anything goes. This is technically a component of Emotional Dysregluation, but I wanted to discuss it individually. Rejection Sensitive Dysphoria, or RSD for short, is defined as an extreme emotional sensitivity and emotional pain triggered by the perception (not necessarily the reality) that a person has been rejected, teased or criticized by an important person in their life. RSD can also be triggered by a feeling of falling short or a sense of failure. It can be triggered when you feel you’ve failed to meet your own high standards or the expectations of others. The word Dysphoria comes from the Greek word Dysphoros and it means ‘difficult to bear’. People with ADHD may appear weak or cowardly, and they often feel that way, but like we just talked about: those of us with ADHD naturally experience emotions more intensely and for longer than the average person does. So when we sense that someone doesn’t like us, when someone makes fun of us, or when someone appears disappointed in us… It hits us really hard. Especially if it’s someone we admire or look up to in some way. I remember when I was growing up I had a huge problem with authority, but not in the way most kids do. I wasn’t defiant or disruptive. My problem was that when anyone in authority showed even an ounce of disapproval towards me, it would literally eat me up inside. I would never ever forget it, and my mind would obsess over it for days. It was torture. This happened because one of the symptoms of my ADHD was RSD. RSD made it difficult to make friends (and actually still does) because I was terrified of being rejected or disliked. It made it hard to hold a job because I felt so afraid of disappointing my boss. The same went for teachers, my parents or any other adult in my life. People with ADHD are often misdiagnosed as Bipolar due to many similar symptoms, but especially due to this one. RSD can look a whole lot like Rapid Cycling Bipolar. The sudden switch from feeling totally fine to feeling intensely sad that comes from a perceived rejection or disapproval can be very alarming. When RSD is internalized it can resemble a full blown mood disorder like Bipolar, complete with suicidal ideation. When it is externalized, it can present as a serious anger problem. It can be expressed as a sudden and enormous rage directed at whatever or whoever the perceived cause of the pain may be. 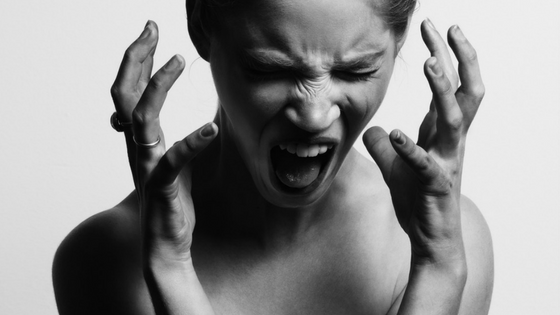 In fact, in several cases of court mandated anger management treatment, the person has had previously undiagnosed ADHD. Social Phobia can also be developed because of RSD. Social Phobia is an anticipated fear that you will humiliate yourself in some way in public or that the outside world will judge you or scrutinize you. Because of how painful it feels to us when we’re judged or rejected, we start anticipating it in social situations and develop a habit of avoiding the possibility of that pain as much as we can. Alright, that’s all for Part 1. 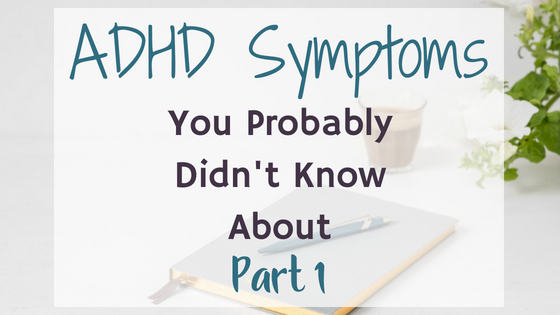 Part 2 will be published on July 6th, and we’ll be talking about 5 more ADHD symptoms you probably weren’t aware of. Be sure to sign up for the mailing list below so you can be notified when each part is out. Have you experienced any of these ADHD symptoms? Tell me all about it in the comments! I love your web site. If only I could have found a website like yours 6-7 years ago. We had a son who had ADHD with other symptoms, I searched the internet to find help with his anger problems to no avail. One of the things I had to learn how to not internalize about. His dad & I both have ADHD. I had to learn how not to panic when things didn’t go my way, with God’s help. Because James had Asperger’s & ADHD I had to learn to calm myself in order to communicate with him and to punish him when he did something he knew was wrong and did it anyway. We couldn’t spank him because that would cause him to behave worse, he had ODD, and had problems with authority figures. Anyway he was pleasantly different and I’m glad I was fortunate to raise him. Unfortunately he died in 2013 – he would have been 30. He had pancreatitis, his pancreas was really inflamed and it caused his other organs to break down. He is with God now, it’s the only thing that helped us through our grieving. Anyway, I continue learning about ADHD and other things. Thanks to your website I’m learning more. Rose, I am so sorry for your loss. I’m glad my website has been helpful for you and I hope I can continue sharing things to help you understand ADHD better. It’s a difficult disorder, especially when it is combined with other disorders. I think it’s beautiful that you have continued to learn and try to understand it more thoroughly. We appreciate it so much when others take the time to do that.